Its not too late to get your ticket for this year’s Beaux Arts Ball, at the Basin Park Hotel ballroom. This is the ONLY Official Mardi Gras Party OPEN to the PUBLIC! Sponsored by the Eureka Springs Historical Museum, the fun-filled ball follows the Mardi Gras Parade in downtown Eureka Springs. Music will be by the wonderful Ultra Suede party band, playing from 8 until 11 pm. Doors & Cash bars open at 7. 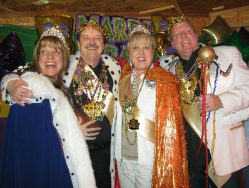 There will be Mardi Gras Royalty, king cakes, costume contest and dancing! Laissez les bons temps rouler! This entry was posted on February 25, 2014 by estcblog in Basin Park Hotel, Things to Do.